Well, its been a very busy week between school stuff, curling, watching curling and Christmas prep. Every minute of every day has been earmarked for something. Sadly, my minute by minute planning of each day in order to get stuff done for Xmas, gets thrown off immensely when I sit down after supper and immediately fall asleep. After speaking with some of my H1N1 survivor friends, I have come to the conclusion that I am not fully recovered. My cough is now only around at night, when I try to sleep. My body temperature won't stay at one level, and my energy level is at about 70%. Still, I feel blessed to be back to work, and the land of caring about things. We arrived at 6:30 to pick up Scott, Michelles' grandmother, Joan, and her aunt Kim. We arrived at the supper... at 6:45... 15 minutes before the meal started. We couldn't find enough seats for all of us to sit together, but the girls sat at one table and just 2 tables over, Scott and Terry sat. The room was full of about 200 people and there was 5 supper serving stations. How it worked was that the 20 first year culinary students prepared and served 5 different courses of supper. We, as family and friends, went from station to station... eating one course at a time. I only made it to three stations. I wanted to leave room for desserts. Then the soups. There was 5 kinds of rolls, 3 kinds of soup. I had Minestrone, but they had Caribbean Seafood Chowder with Black Rum, and a cream soup of some sort. The rolls didn't look as good as what Michelle makes, so I passed on them. Later she told me that the cooks made them, and they never turn out well, because they are not BAKERS.... a little snobbery going on there. One of the stations I missed was the Pasta station where they made your pasta dish right in front of you. The line was so long, I decided to pass. The other was seafood and sushi station. I don't enjoy either so I stayed away. Some of my table mates had the vodka soaked oysters, the tiger shrimp on a stick, and sushi with the Norri on the inside instead of the outside. It was beautiful and they all enjoyed them. Kim made it as far as the pasta bar, and she enjoyed her pasta. Terry, Scott and I met up in the meat station line, and we compared notes on what we had eaten already... and there we were lined up to go through the longest table of food. I couldn't take a picture because it was filled with covered servers, big heat lamps and people all around. They served us pork loin, jerk chicken, spicy haddock, roast turkey and risotto with PEAS (no thanks), twice baked potatoes (my recipe is better), stuffing, gravies, juices, stir fried medley of veggies... beautifully done!!! Now, my plate below doesn't look that appetizing, but truly it was. It was hard to chose, so I had a bit of everything, and the cooks just sort of piled it on my plate. Then we were on to desserts, tea and coffee. The bakers were in groups of 4, and each group had to prepare, display and serve a list of generic items... 12 tarts, one cheese cake, one coffee cake, two kinds of cookies, cupcakes, creme desserts, a yule log, candies, chocolates. 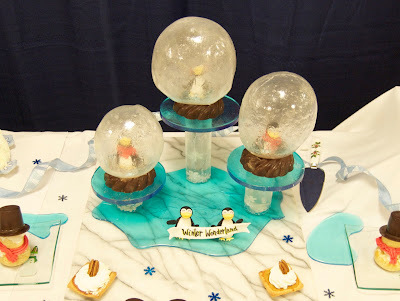 Now, the theme of each table was their own idea, and the types of desserts was also their choice. They prepared a menu, and work schedule and task list to be completed. Michelle was the team leader and found it very challenging to be the boss of your own classmates and it was frustrating at times. She is glad that part is over. Below is my table mates desserts. He had a cream puff snowman with a chocolate hat. A truffle, a chocolate mousse in a chocolate cup. He was eating his dessert while I ate my turkey/chicken/pork/fish/veggie plate. It was hard to concentrate on my dinner while I stared at his desserts... he chose all his desserts from Michelle's table, mostly because his daughter was also on Michelle's team. I had decided long before I visited the dessert table, that I would chose just 2 desserts, and both would be from Michelle's table. There were 5 tables, created and manned by the 5 teams, all with the same components but all VERY different. Michelle's Team center piece. Very fun. I got so excited about my desserts, that I forgot to take a picture of what I chose. I chose a raspberry sorbet dessert with vanilla ice cream, in a candied bowl. I also took a sweet little square raisin tart. The little tart is in the picture above, its pretty small, but amazingly delicious.... the sorbet was fantastic, and the only picture I have is on the plate of desserts of the gentleman next to me, just below, its the round red dessert at the back of his plate. The bakers answered questions, cut and served their desserts with pride. There were so many, at least 100 different desserts to chose from. I left the dessert area with my two treasures and a cup of tea. Terry went for cheese cakes, from two different tables, and Scott had probably 3 different desserts. Kim had two different cheese cakes. I enjoyed my desserts immensely and wouldn't chose differently, but wished I could have had 3 more!!! I tasted Kim's cheese cake and it was the most amazing creamy cake. I wanted more!!!! At the end of the night, the cooks and bakers took a bow and received a standing ovation from everyone. After the crowds started to leave, and before the students were banished to the kitchens for clean up and dish duty, they were released from duty to eat what they wanted. It was fun to see the cooks head for the desserts and the bakers head for the meat, cheese, soup tables. We got a quick tour of Michelle's kitchen, we met Jean Luc and then we headed off to the Matheson's house, and it didn't take long for me to peel off my pretty duds and put on my PJ's. Michelle called about an hour later, and the boys went and picked her up. She brought home the cheesecake I fell in love with, and a cappachino cake. She said they took home a couple of things each and the rest got thrown out.... can you imagine. Those girls were so sick of sweets they couldn't bring themselves to take anything else. Please go to Michelle's blog here... to see her side of the day. She has a lot of great pictures. WONDERFUL!!! Can I go next time. The food looks so awsome. What are the little round balls on the cheese table. Is that the new way to serve a cheeze ball. Great job Michelle. OMG! Everything looks soooo tasty! I love the little snowman dessert! Almost...ALMOST too cute to eat! The presentation of everything is truly spectacular! I love Michelle's groups centerpiece. So cute!